When asked what led him to co-found publisher Orpheus Self-Care Entertainment, Job Stauffer did not have a rehearsed, concise origin story for the VR start-up. Instead, he has a 17-minute retracing of his career that alternates between a thousand-foot view of industry trends and a handful of impactful personal moments. It's clear that there isn't so much a single "a-ha" moment in his story as there is the sense of professional and personal lives aligning to push in the same direction, guided to this point by a number of key moments and influences. There was Stauffer's mid-2000 stint with Rockstar Games, where he signed on to do market research before transitioning into public relations. In the wake of Rockstar co-founder Dan Houser talking about working 100-hour weeks to finish up Red Dead Redemption 2 last month, Stauffer made headlines for saying that his time at Rockstar was "like working with a gun to your head 7 days a week." He was more diplomatic when we spoke to him, simply describing it as "an extremely intense work environment" and coming somewhat to the defense of Houser and his brother Sam. "They are sweet guys on a very personal level, but they are absolute workaholics," Stauffer said of the Housers. "And that tone that was set in that office for a number of years definitely set my own perspective and mindset on what is normal for working and working very hard." "The stress, anxiety, and all the crunch at Telltale drove me to a point where I was told by my doctors I was going to die if I didn't slow down and take better care of myself"
Stauffer left Rockstar in late 2009, but carried many of the work habits he learned there into his future jobs in the industry. When he landed at Telltale Games in 2012, the studio was just launching the series that would define the company, The Walking Dead. Stauffer was responsible for building up an online community for the studio and serving as the liaison between the developers and the fans, traditional games press, and the emerging breed of streamers and online influencers, all of which became much bigger jobs once The Walking Dead took off. And as was reported earlier this year, Telltale had its own work culture problems as well. "At Telltale, we moved at such a rapid, exponential growth rate from 2012 to 2017 that it was a lot," Stauffer said. "I literally worked on every single episode of every single game that came out, both creatively and on the marketing side, too. Everyone got to contribute at Telltale; it was too fast to not have feedback and input from everyone." Things came to a head after Gamescom 2016, where Stauffer had travelled to promote Telltale's Batman series. "The stress, anxiety, and all the crunch at Telltale drove me to a point where I was told by my doctors I was going to die if I didn't slow down and take better care of myself," Stauffer said. "I was constantly worried about episodes going out, script reviews, actors coming in [to record], podcasts... there was so much going on at the studio at such an excessive rate that it definitely took a toll on me both physically and mentally." Stauffer took some vacation and toured Europe. Even in his brief time there, he noticed how European cultures take wellness into account. Trying to lose weight, he went to a gym to work out and discovered that half the gym was the fitness center he expected, but the other half was a wellness center offering aromatherapy, mineral baths, and other such treatments to help slow down and relax. Ironically, Stauffer discovered one of his most effective wellness routines that same year while doing work for Telltale. In researching VR for the studio, he discovered Soundboxing, a kickboxing rhythm workout game where players can watch any video on YouTube, create "beat map" routines for them or punch along to other players' routines. "I realized this immersive medium was completely different from what we've been doing for 30 years, just looking at a static image on a 2D screen and mimicking what's happening on that screen"
"I found it was so much fun to get up and move my body with six degrees of freedom in virtual reality," Stauffer said. "I started working out, started sweating, and started realizing this is so intuitive and completely fascinating. It was a totally new level from all the previous workout pitches we've had in the games industry and the fads that have come and gone, like DDR pads, Wii Fit boards, Wii Remotes and Kinect. "I realized this immersive medium was completely different from what we've been doing for 30 years, just looking at a static image on a 2D screen and mimicking what's happening on that screen. It's totally different from being fully immersed and having full spatial design, full spatial computing where we're able to pull player's puppet strings, have them move their bodies and get them so quickly into a flow state more easily than anything else. It was such an eye-opening portal into the future of games and more than games." Fast forward to 2018, and Stauffer's interest in VR has only grown. He has lost 100 pounds in the process, and he said the exercise has helped him lower his stress and anxiety in the process. That said, it hasn't been all smooth sailing. Earlier this year, he left Telltale with a pretty clear understanding of its likely fate. "Once you burn out, self-care is really your way out, realizing that you're the only one who can take care of yourself"
"For so many people around the world, depressed or not, these things are just so genuinely good for you to do. They're good for your mind and good for your body. There's no doctor in the world that's going to tell you meditation, dance, or making art is bad for you. Witnessing that first hand and hitting that rock bottom of totally burnt out by the games industry totally changed my perspective on how hard we need to be working across the board. "Once you burn out, self-care is really your way out, realizing that you're the only one who can take care of yourself. It's on us all to decide when to stay stop, whether that's to stop working or stop doing things that might be harmful to your mind and your body and start taking better care of yourself. All these ideas started to resonate with me this year more than they ever have. It seems to have been a big mood of the year." After Telltale, Stauffer connected with his future co-founders SoundSelf creator Robin Arnott and Austin-based artist Heather Ray and to talk about what they could do together. "We talked about the kind of content we want to bring to the world," Stauffer explained, "taking traditional self-care practices--mediation, dance, and making art--and how do we make these things more accessible to people so that people are taking better care of themselves all the time? This immersive medium has already opened this gateway for thousands of players across the world. It's just that we don't have the hardware shift in the market yet that opens the possibility to the mainstream audience." They also enlisted a board of advisors consisting of Devolver partner and Good Shepherd co-founder Mike Wilson, Willow Group founder and former Blizzard Asia Pacific director of operations Nichol Bradford, and Burning Man director of technology Heather Gallagher. So far Orpheus has three projects announced. First, there's the aforementioned SoundSelf, a VR meditation experience where players use their voices to alter and adapt an audio-visual experience that looks to facilitate a meditative trance. Then there's the more traditionally game-like RaveRunner, a rhythm game where players use the controllers to intercept an onslaught of colored prompts rushing towards them in time to the music. 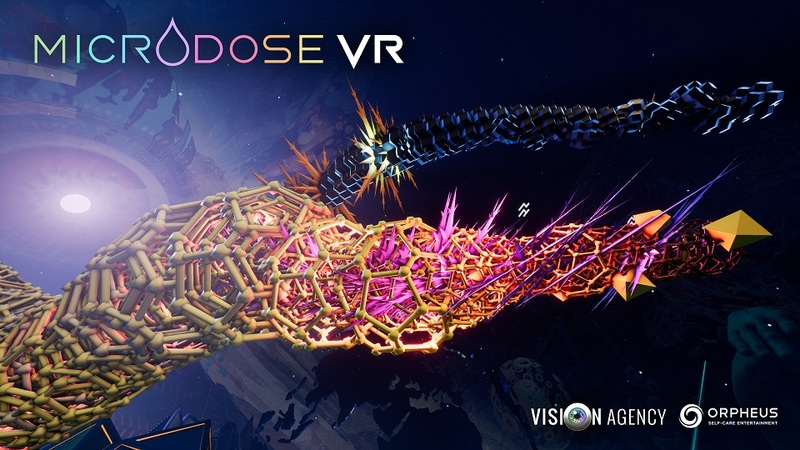 Finally, there's Microdose VR, an expressive multiplayer music and dance experience. "We thought long and hard before we decided we wanted to say this, but once we did, we decided it was right: Orpheus is more than video games," Stauffer said. "What we're providing people is content that has a genuine benefit to the mind and body. "I've spent hundreds of hours playing something like Skyrim or Grand Theft Auto or Red Dead, and it's fun. But you're sitting on the couch, and you're just kind of there. We consume this entertainment, controlling it with our minds, our hands, and our fingers. Ultimately, apart from the fun and sheer entertainment value of what traditional video games offer us, we've really started to rethink what is the nutritional value of a game for your time spent playing it?" While Stauffer said the company is absolutely focused on fun in its games, it's not blind to the opportunities beyond the traditional gaming business. Games may bring in well over $100 billion a year, but Stauffer put the worldwide wellness market at $4.2 trillion, and the overlap between the two industries is a blue ocean opportunity. Stauffer saw evidence of that at the recent Oculus Connect, where he interpreted comments in John Carmack's keynote address as mildly scoffing at people who thought the future of virtual reality may lie not in video games but in health care. "It was apparent to me then honestly how far behind even some of the greatest powers-that-be in the VR business are still just now realizing that the greatest potential of this medium isn't sitting down with a controller, isn't hanging out and shooting things," Stauffer said. "It's not always going to be a seated experience. The biggest potential of this medium is engaging the mind and body in full."